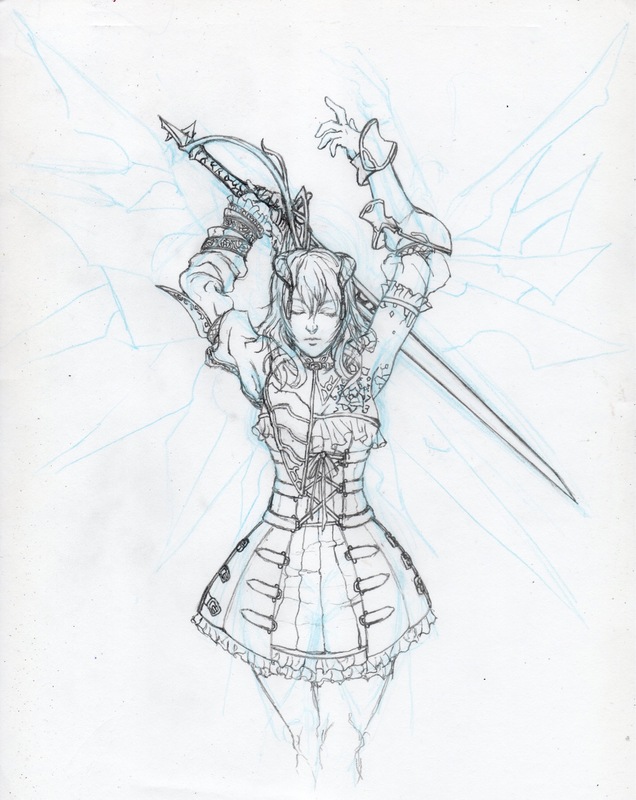 I have been in the mood to draw some art for CV OCs and some Bloodstained Fanart. I had previously have been speaking with the friend of mine about undertaking a Bloodstained Web-comic project, but due to life and time restraints we feel like it would be a grand undertaking to even begin this late of the game not to mention having to do the heavy amount of research to piece together a comic with an Kojima-esque art style which I have been learning and slowly mastering. Even though the project was dropped, I still would like to attempt a few pages to honor the message I have left for Igarashi-san. 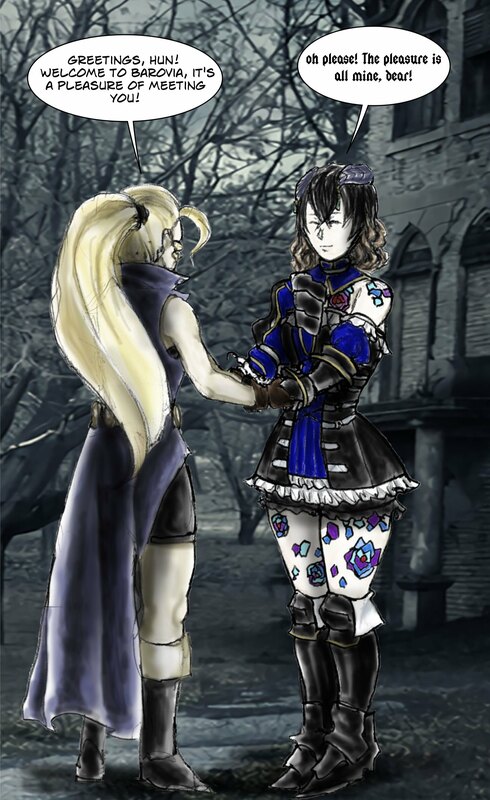 I'm sure you remember this featured from one of the Bloodstained Updates. You can find the DA page here. Ideally I created this traditional painting as the intent of setting an art cover for the comic. It's not my first time attempting a Kojima-style art, but I believe I may have came closer in essence than my previous works many years ago. I have been putting this style into practice as I am preparing the 3 page comic which I will write and illustrate on my own time just for devotion's sake. I feel it's safe to display my love and inspiration for this style of art as a big fan of Igarashi's team and many of their fantastic works. I have to say it was not easy to adapt to this style, but I hope my attempt to do so will merit some praise and respect in expressing my love and passion for the games he has created for this genre. on point with the setting. I give my kudos to the players with such a superb dialogue in their role playing! pleased with the result just much as she approves. 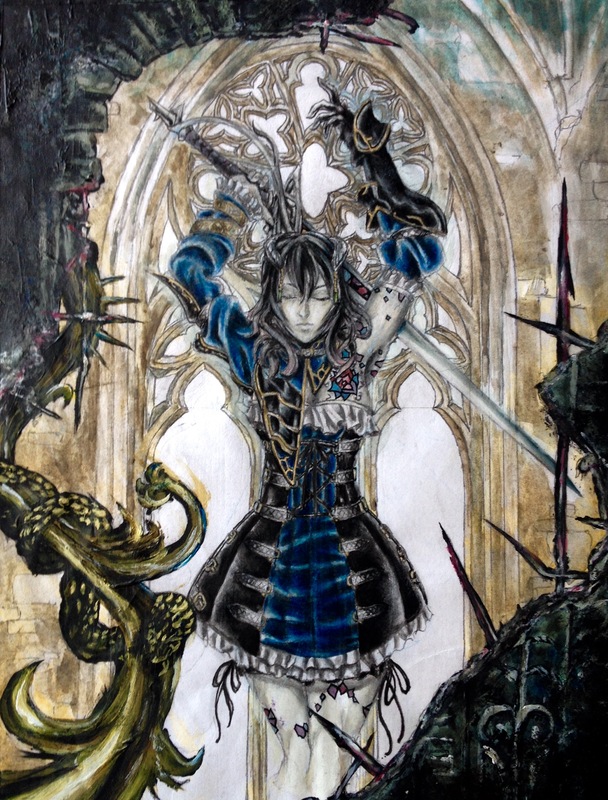 If I be permitted I wish to draw the rest of the characters to see them drawn in a fashion seen in Ayami Kojima's works with more of a home-brew feel to give it a sort of uniqueness and originality that will tailor them to the story fittingly. I will also be looking to posting other works similar to this style when I have the time and will also share the previous works of art that I have attempted in the past. 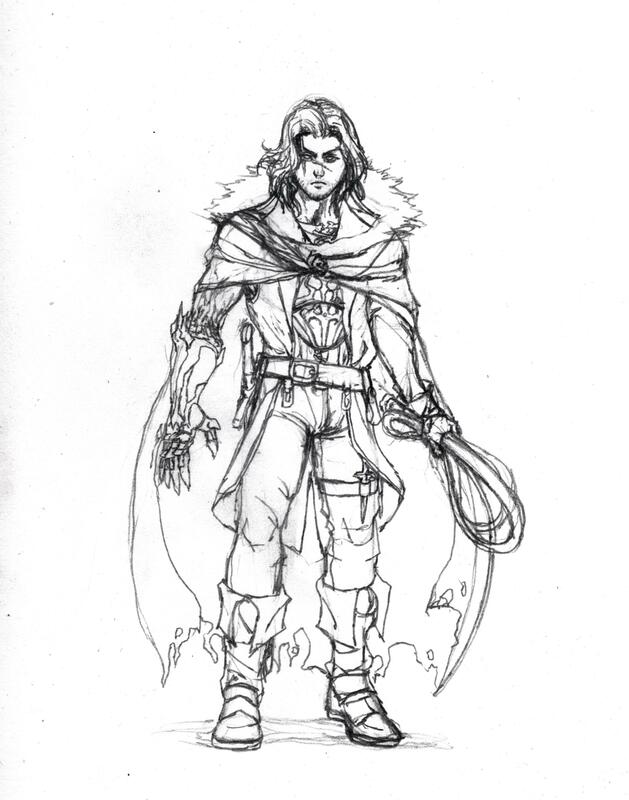 I myself ran a Castlevania game some time ago for a test-run and have a revised character sheet design which I will also post. Thank you for the chance of letting me share these and more. I have been practicing with colors in photoshop for some time, but there is still much I need to learn to use PS effectively. You can see here that I have tested out the waters with this picture. For some reason the canvas in Photoshop show up a lot warmer than the actual image file, this worries me as I can not accurately apply the right colors with the naked eye and had to go over each layer and adjust the color balance. I'm content with this portrait on a conceptual standpoint, but I will try push to become more effective with my brushes. 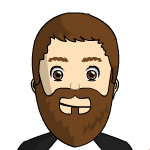 Here is a concept I have been fooling around. Initially I have had a different design in mind and was going to have him dress somewhat lordly, but during the development of this character it had undergo many changes due to experimentation borrowing from a number of references. Quite different what I originally had in mind, but I also wanted to keep true to the style that's relevant to this sort of genre. I like the roughness of his outfit which, again, wasn't intentional. However he definitely looks like he is ready for battle! 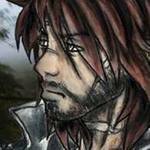 I will be drawing a profile picture of his face for a better look as well, but more importantly I will also include him in a cover art style in pencil to see if I can exercise this form of characterization. If I am to make a comic this way I will have to stretch my comic rendering muscles. I also have another character in mind I would like to try drawing, but I will work on these first and will put up other pictures which I also intend on revealing. More to come soon. Hello everyone. I have something special for all of you and yeah, this is something very unexpected. 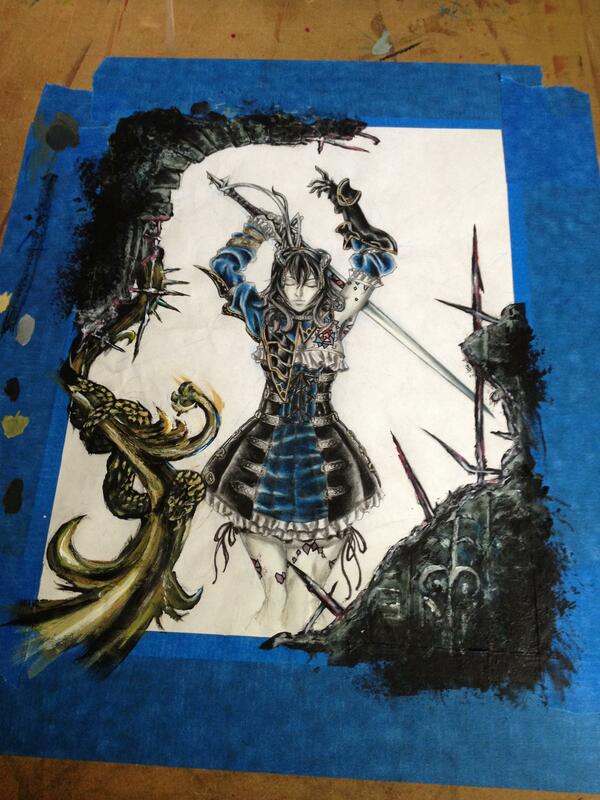 As I was digging though my old saved files of works art that I have scanned and stored away I have recently dug out progress pictures of the Bloodstained cover art painting I did a while ago. Yes, the very same one you've seen in Update #47. I will post them all here and give a brief description for each picture. Allow me to start from the beginning.. This started as a very rough concept. I have done the homework of looking up in how Ayami Kojima had painted her works, the media used, and the method of using them. With the little information I had scavenged in the world wide web I have continued to break down the method into steps from what I could work with in the best of my knowledge. This is actually the second picture of Miriam I have drawn that made the cutting board. Satisfied with the result that met the required look for a Kojima-style art form I continued with this drawing onward. 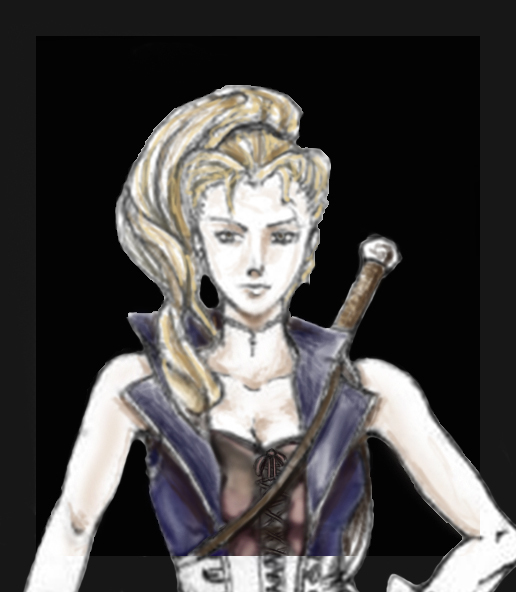 Here is a rough drawing of Miriam, You can see the background is still being conceptualized in which is still a working progress. I tossed around the idea of making wings behind her made of stained glass that perhaps burst from a Gothic window frame for a colorful radiant light effect, but the idea was debunked because of the difficulty of producing a visual effect in such a small composition size especially with the limited mediums that I had to work with. 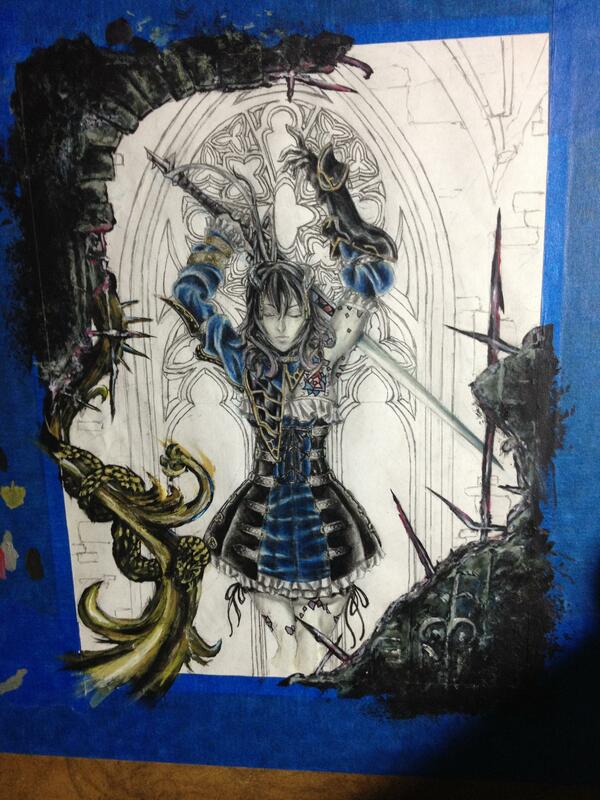 The time I was working on this I had very little room and most of my art supplies were kept in storage. Not a very comfortable workspace, but it is what it is and wasn't going to let it deter me from finishing a project that was in hiatus since the beginning of last year. On this step I proceeded to do shading with regular pencil. I was very careful with the finer details and were able to keep the picture clean for my first try. It is almost like an art piece of it's own. Kojima-esque, but much more like it's own creature. I kept my pencils pointed and my technical pencils loaded just to not blur out any of the crisp detail that I had accomplished thus far. Here is where I start to apply ink wash and detailing the lines with Micron technical pens only at where the contrast are at it's darkest. 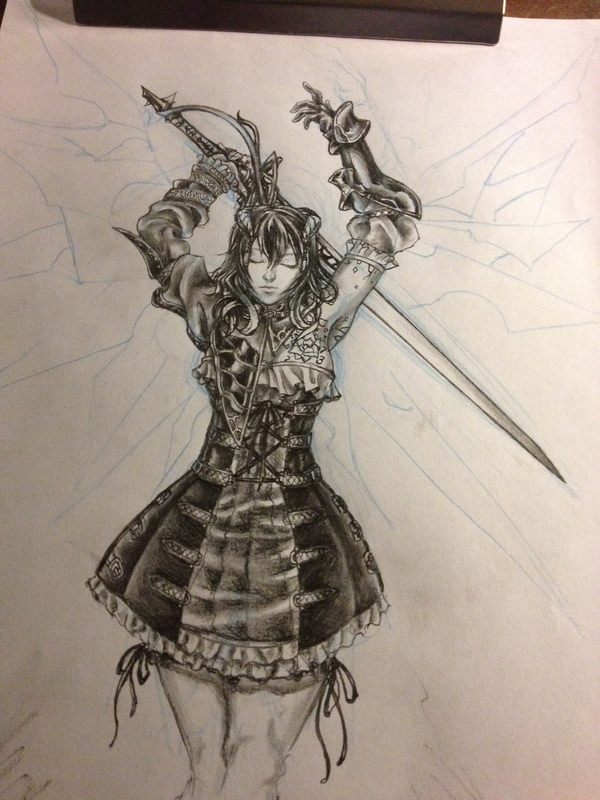 The lighting of this picture was bad, but the contrast of Miriam's image has buffed since it's pencil shading. The details were kept in clean and pristine condition. The black and white was a visage that kept it sharp, but what comes next may have proven to be another challenge difficult to overcome without losing it's finest detail. At this point I had followed a procedure that seemed delicate in a way that felt like constructing a machine. Like if you were to piece together a jigsaw puzzle for a completed picture or Legos to get a complete model there are certain pieces that go in a particular area. Like with this, some areas are needed to be worked in with a different medium than others. For example the blue of her dress and parts of her skin were carefully washed with watercolor. Same with the blade of the sword and the stained glass looking designs all throughout which has heavy emphasis of color in them. I later gone over the details with color pencils for the rest of her outfit and brought out more of the black while smoothing out the texture the color pencils make naturally. I switch between these mediums back and forth till I get the desired look. You can see pencil lines are still apparent in this picture. Here is a closer view of the face and the upper torso. You can see how the colors from different traditional mediums combine together. Again, this picture isn't the best example due to it's harsh exposure to my lamp light. Here I taped down the picture onto a board to work on the background. I had penciled out the foreground and was using Kojima's works she had made for the Castlevania series as an inpiration. 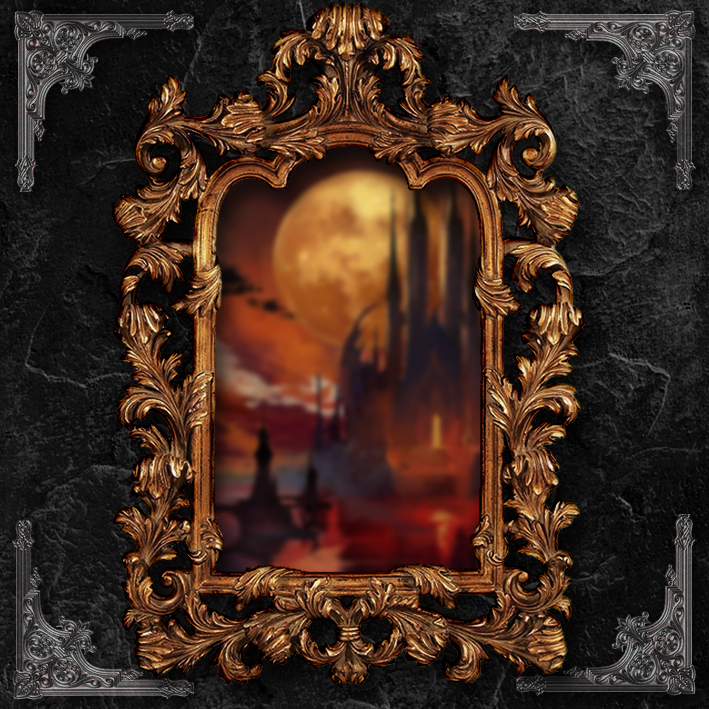 The foreground is much more reminiscent of that of Symphony of the Night, Lament of Innocence, and partially from Chronicles. This was all done in acrylic, but was able to go over some parts with color pencil to better bring out the highlights. I wanted to mix together a medium that will give me that heavy brushstroke texturing I would find so often in Kojima's works by using some form of paste I can mix with the paint, but I failed to prepare the medium beforehand. However I did notice something as I had continued onward with the painting, oddly enough those brushtrokes I loved so much started to appear very gradually. I let parts of the part dry a little more so the brush won't take away the texture. There wasn't much of it, but the brushstrokes was naturally there and preparing the medium in the end ultimately wasn't necessary. On the right side you can see some of the blue as I was trying out which medium works best in where. I began to work in the background around this point. I was really upset that Miriam gotten dirty from some of the smudging while I was working on the background because I had worked so hard on her and made every effort to keep her clean. None the less, I convinced myself to push onward with the background as I would later go over cleaning up Miriam once I am close to finish. The feeling of defeat for not being able to keep my art clean has made me felt like I was back at square one, but it was really only the background that needed to be finished. Needless to say, that too, took many steps to complete. I first started looking up various references that I can print out and trace on tracing paper on both sides. I avoided the areas that were colored of course, traced the image onto the canvas and then penciled in the tracing. I've added some parts that will resemble a wall that also include an arch that hopefully lined up with the composition. The next step followed shortly after. With this step I've shaded some parts here and there and did a light wash with watercolor to solidify the walls and the window frame. Oddly enough, this gives the illusion that the structure Miriam is inside of is well lit by the light of the daylight sun. I was rather impressed with the way it came out and as much as I wanted to leave it I felt like it didn't quite suit the theme that I was going for, but perhaps that I will revisit this in another painting I thought. I was done some wonderful watercolor pieces in the past, but it's been too long to actually come back with what I've learned when I'm very out of practice. The right corner of the background was a blue bled intended to capture the mood that later became a marker for my final step. Finally this was my final step in completing this painting. All of the mediums that were used previously where on the table as this too became another step by step procedure. I first gone over the penciling with ink, but didn't merely trace the lines. I also cross-hatched to build up contrast just visible enough so that I could still see after filling in with the watercolor. I kept water nearby so that to balance out the amount of watercoloring. The red was dominant because it stood out more from the foreground than the blue did, but the blue set the mood just right. right where the blue and red meet I decided to do something different. I used a red ink pen to create those rippling streaks to hopefully resemble blood in some way while at the same time pulling in some blue which at this point started to turn the blue into a purplish color. This effect was never tempted before, so with this painting alone I have created a new effect in watercoloring. The darker parts where gone over with color pencil, the texturing were kept as I thought for a stone structure it was very fitting. The streaks of light were created with white strokes of acrylic, the softness of the light was done with color pencil which was also smoothed out. I was careful not to overuse the white because I wanted the window frame to still reveal it's structure around the light that pours into the composition. 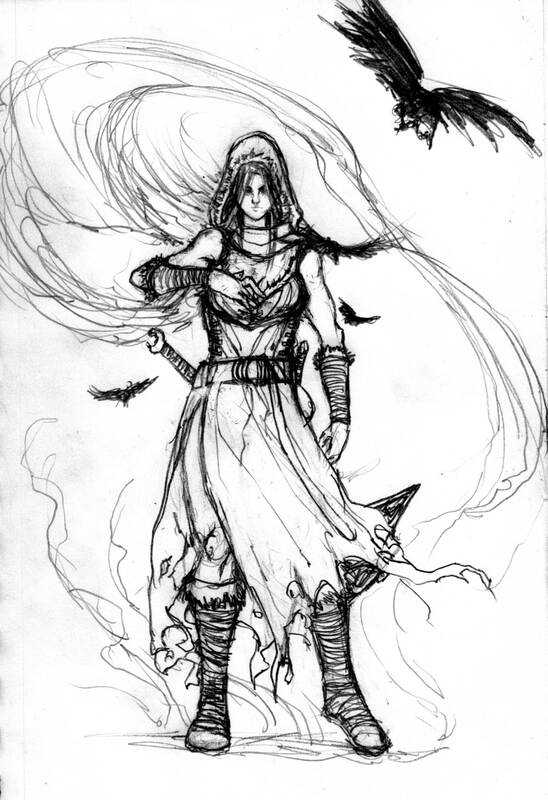 So with this I finally cleaned up Miriam to the best of my ability and had finally scanned for upload. I was able to clean it up a little further with Photoshop to make it more visually presentable as a digital image. So in case Ms Igarashi, Ms Kojima, or any Bloodstained fan would wish to print this for a poster or whatever they're welcome to do so. With all that said and done, this was in fact made with the intent of being a cover art. Why a cover art you say? Because what truly convinced me to purchase a game that Igarashi made was because of Kojima's works of art. She was the face of the market for whichever Castlevania title Igarashi had a hand in and by doing this I honor both him and Kojima. 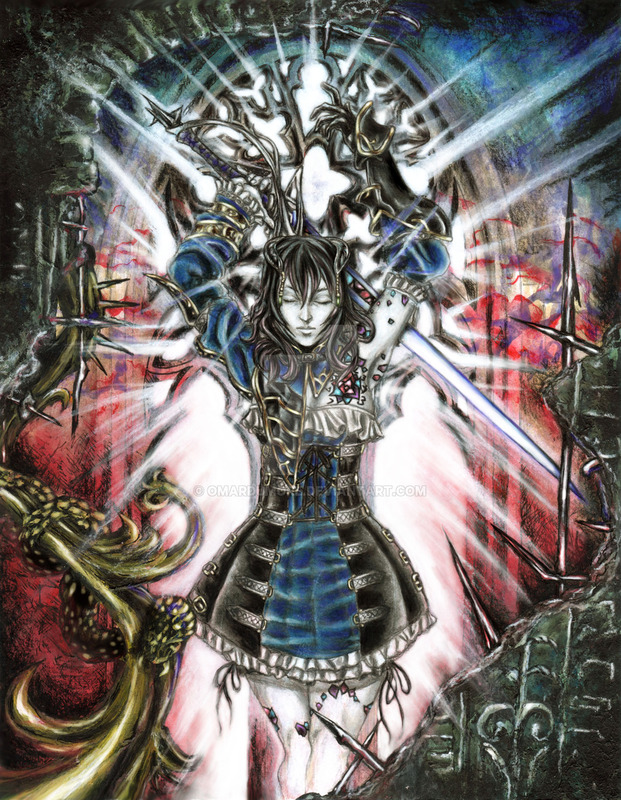 I visualize this piece as a cover to the cover of Bloodstained as clear as blood in water. So with that in mind, this will be used for a cover art for a mini fan-comic in which I will take it upon myself to create 3 pages of utter perfection. Training hard I will be to make sure it is the best 3 page comic that anyone will ever read. As for the original painting, it is kept safely in a folder for the change to one day finally meet it's master. It has to be me to finally give him this painting in person. Ultimately with the hiatus and all it took roughly about a year to complete. I have nurtured, cleaned, restore, worked in this painting for so long it would be a disgrace that such a painting will be left with those who will pass it down with a chance of it being lost forever. Maybe one day I will have a chance to give him this painting myself, if at all just for that. So for the next post, well, you know. More art coming soon. I've worked hard on this one. In particularly because of this character having two different forms and we all know who this is that is for those who have played Castlevania 64. 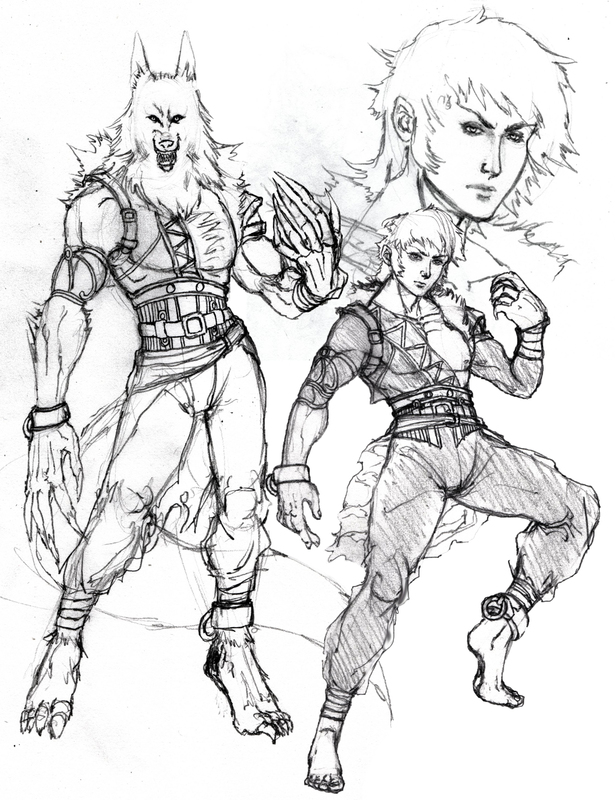 Cornell has to be one of my most favorite characters in the Castlevania series even though the story-line for Legacy of Darkness was retconned, Cornell as a character concept was still remembered. I had the pleasure in redrawing Cornell in this style as I had saw it fitting for his appearance. The design concept of his outfit from both Cv64 and Legacy of Darkness were combined. His short woolen vest was made more into a sort of harness look. Everything else with only some minor tweaks stayed the same. Wish to see more characters in this style? Who will I Kojimatize next? There will be more coming soon. Here is a drawing that I had finished the other night. 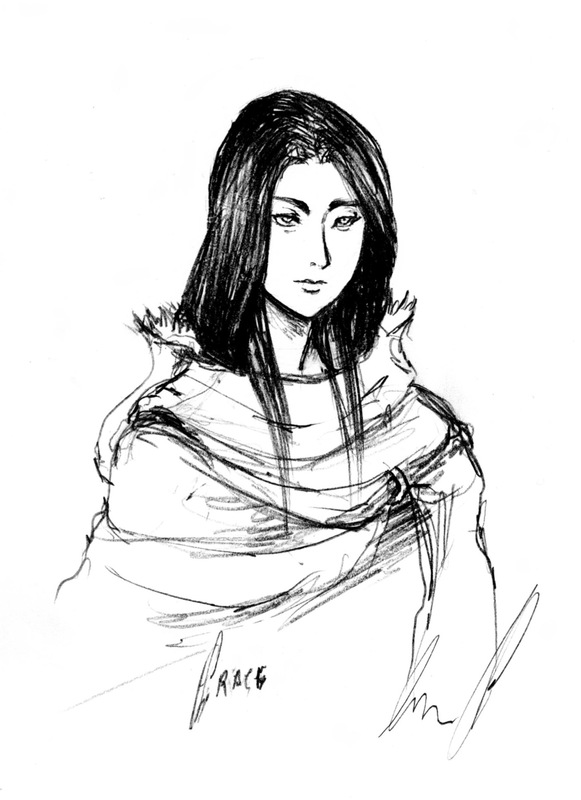 This was drawn during and after the fight with Bloodless in the Bloodless Battle Thread. It is not quite in style with the other ones I have posted here, but drawing dynamic poses was ideal none the less. 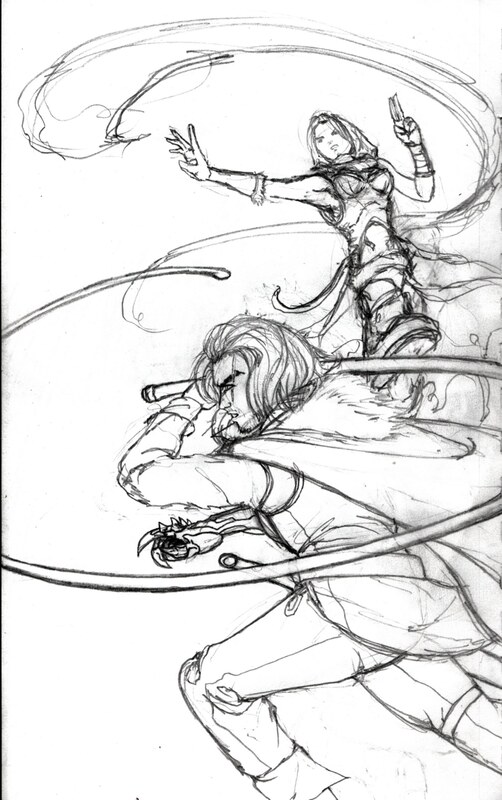 I'm happy with the way this one come out as it shows that I can still draw action poses. I will do more of these for a few of my other drawings that I will continue to work on. 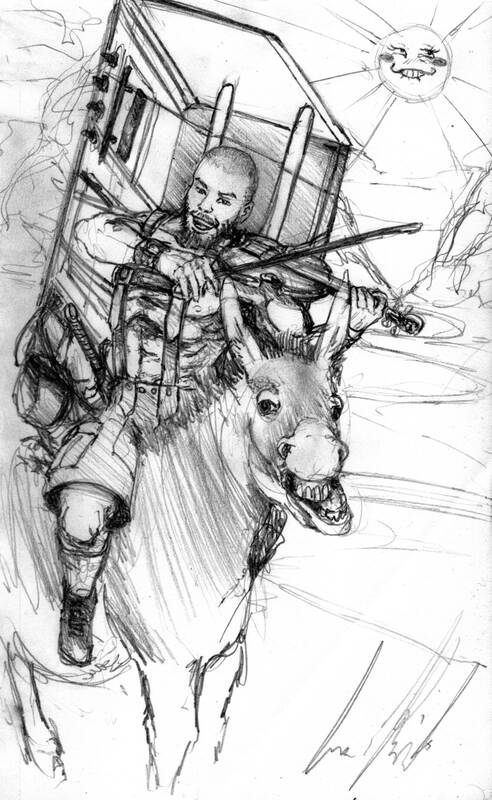 Our wandering Bard! He fights with his music and brings happiness across the land! Once again, Happy Birthday my friend! Here is another picture I have drawn that follows the ideal KojimaVania style, this time I have used more of a vigilant posture to capture the moment of action. The dynamics will be practiced and exercised to give that flare of excitement when the mini-comic production starts. 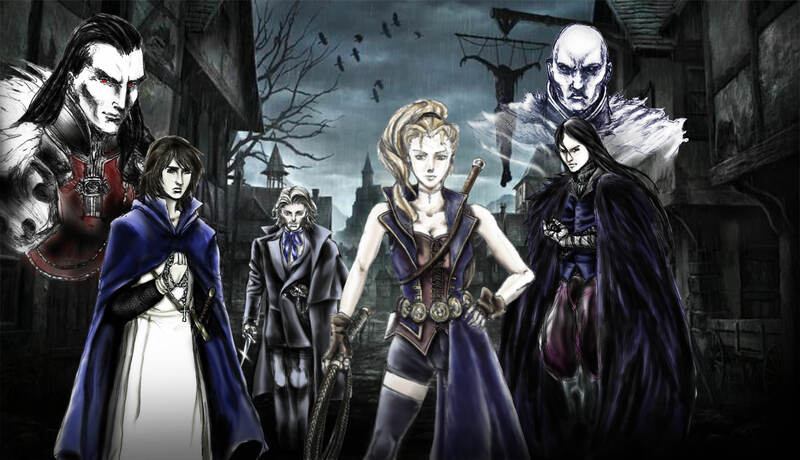 Our main cast for our characters in Castlevania: Ravenloft (CastlevaniaLoft). 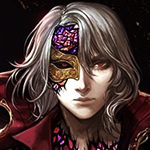 For those of you who don't know XombieMike runs a gorgeous game of D&D storytelling that can be seen on YouTube and now Twitch, if you all get a chance please stop by our Official Bloodstained Discord for more on this! The characters presented here are as follows, Huntress in the middle Sunraiser , the feathered caster on the right redmalkav , the butler to the left limeytx , The blue cleric in the far left is purifyweirdshard . 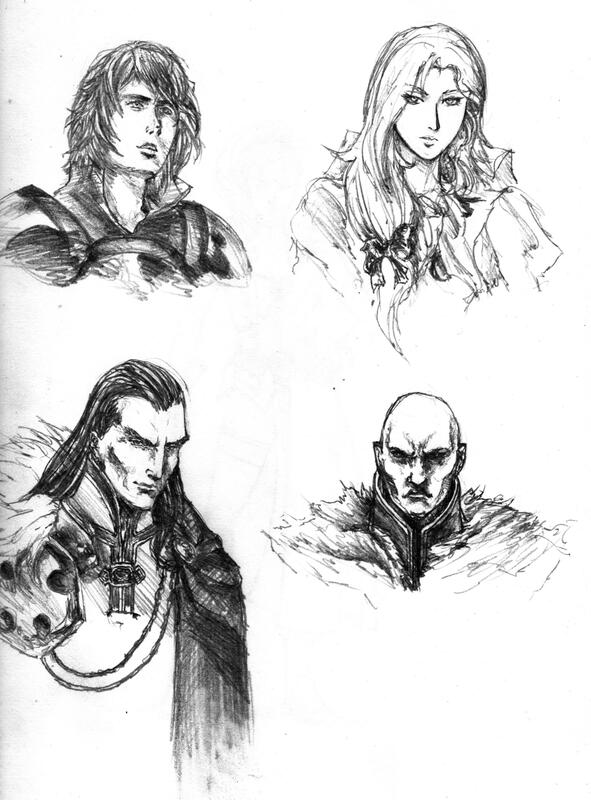 The top are the NPCs, right side is Izek and the left side is Strahd. There will be more to come for December! yugosalkins I really want to see that second image coloured Frazetta-style! What a treat to wake up to! All of these pictures are brilliant. The Enkeria picture looks just like him, and the whole scene is funny as hell. 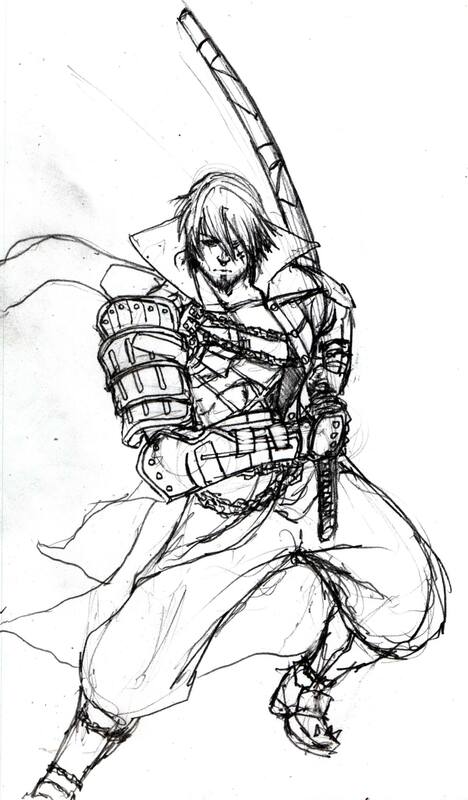 The Zangetsu pic is so good and I want to see that featured in the next update. 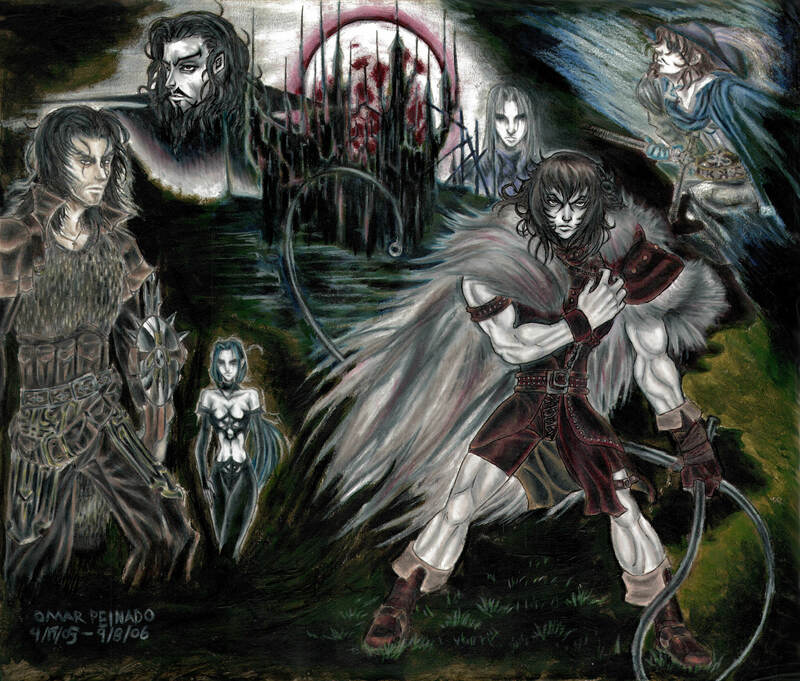 The Castlevania Ravenloft picture is of course my favorite. 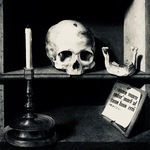 I'll be sure to put it to good use as a wallpaper and incorporate it into Fantasy Grounds as the new background image. Thanks once again Yugo! I have it as avatar on Discord, and on Facebook. Hehe. Yeah, funny details! Hmm, that would be very interesting. I think I'll give that a try when get some more time in. Thanks for your input! Hello everyone. I know I haven't been on for some time, but believe me I have been doing art despite how busy it is this time of the here. 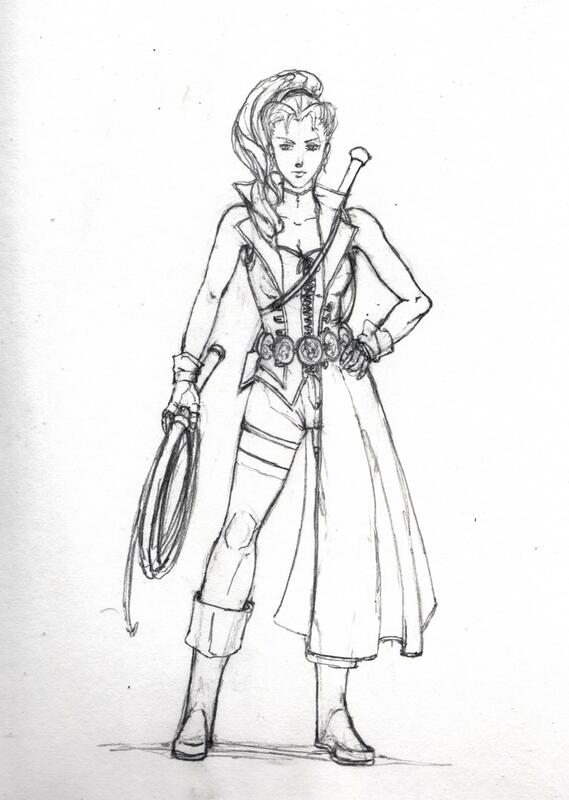 This is the character that accompanies the whip wielding character from earlier. I have decided to draw this female spell caster to sort of test the style further with the female anatomy and with a close-up profile included. In terms of drawing the face I think I am hammering it down quite well, but am still trying to control the eyes a little more as you can see. 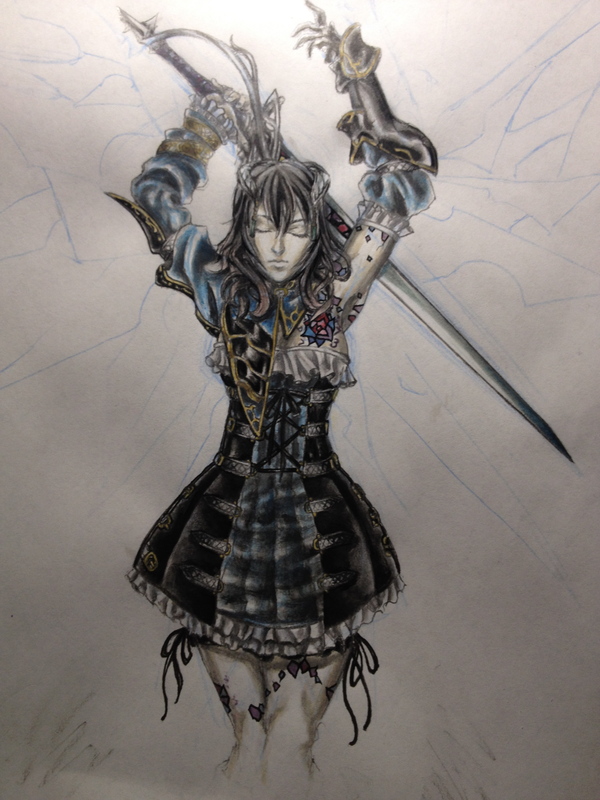 Here is the close up for the whip wielder. 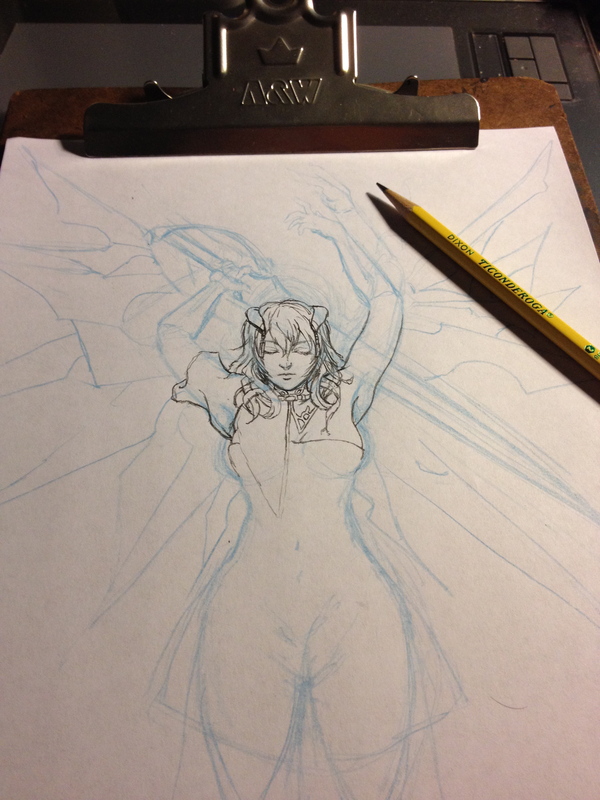 With this I feel that I am ready to proceed with the paneling for the Bloodstained mini-comic, but I have to be honest with you guys. Even with how much progress I have with this from an art style that is not my own I am still very worried with how it's going to come out or if it even measure up to the quality to the style of the game and concept art that it rightfully deserves. So with even with all of this in mind I am going to charge forward into this project to give this a stunning masterpiece to the best of my ability. As of right now, I'm not quite worried with the dialogue than I am with the scenes for the comic, but I will still be open to anyone who would be willing to participate. Who knows, I may just leave the dialogue out and let the viewer decide. 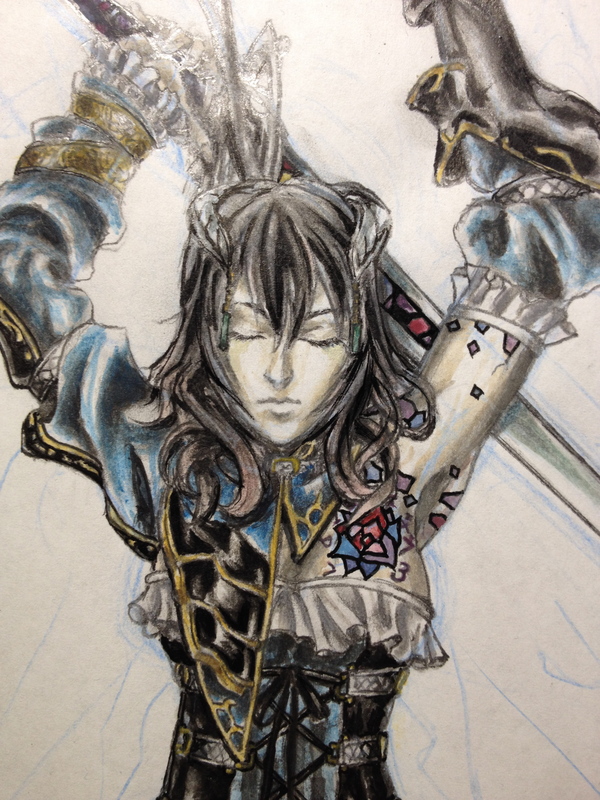 All and all I will now dive into the project so you may not see too many activity on this end, but please stay tuned for more Bloodstained and fanart! Such cool characters and style you got going. Would like it many times over man! Because I'm on the lookout for Goofball I decided to come back in and see how are things going since my absence. I forgotten that I had an art piece or two that I forgot to post up here, but luckily today is much more fitting since it is April 1st after all. A big surprise for you all my fellow forum friends that I am bringing back, behold, the Pillar Men of Bloodstained! Forgotten about this? So did I, but I give my thanks to Goofball for reminding me. I wish you all a Happy Easter, from me to you. Happy Easter Hunting! Keep it up, Bear Cubed! Take care and keep it up!! Thanks for all the compliments everyone. Things have been dragging slow, but I picking up the pace just a bit now. There are two pictures I would like to share here. Here is a restoration of an old painting which I did back in 2006. 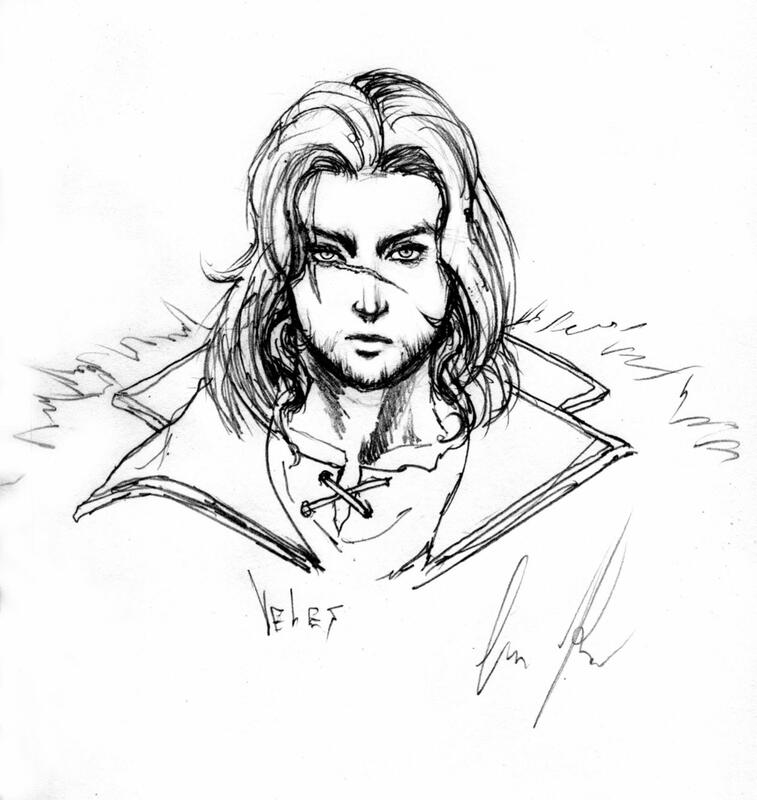 I started my first Castlevania tabletop rpg I had once home-brewed with a couple of friends after High School. Even though it only lasted one session, I still painted a poster of the 2 player characters and the NPCs in the back. 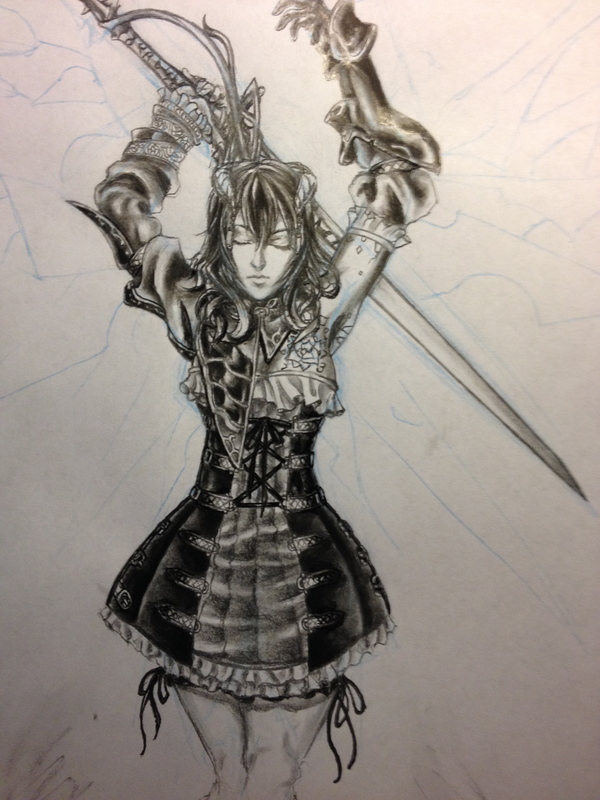 Here's another one I did for Bloodstained which I had forgotten to put up. 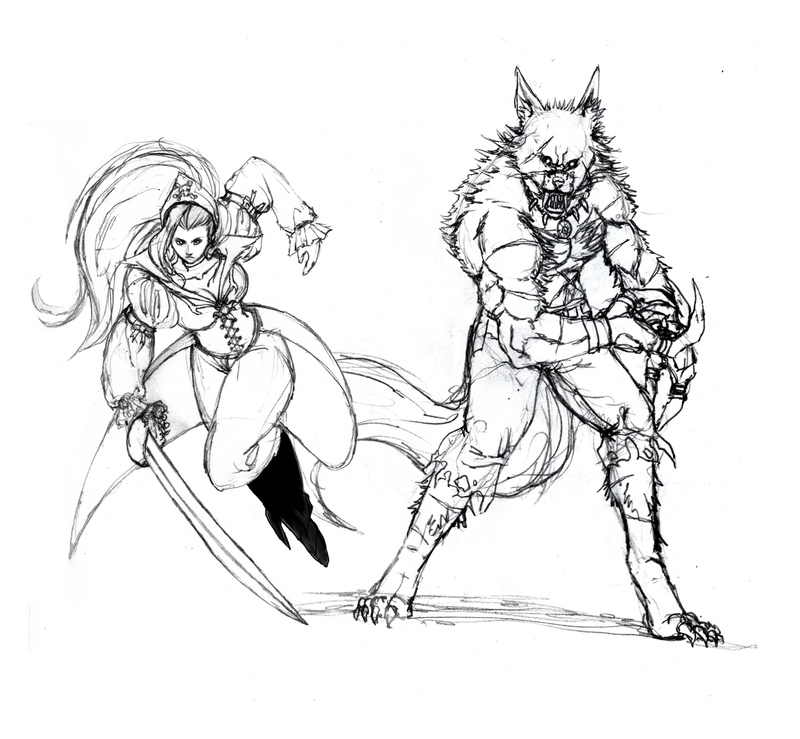 This is more like a crossover, but it would still be AMAZING to see in a Ravenloft game. The captions bubbles were thrown in there for comedic effect, not really a scenario I would picture exactly. Really just a gimmick if anything. Later on I am hoping to open up a small project that's like a comic, but with more visual than anything. I haven't decided if it'll have any dialogue, but I will be wrapping up an major project soon to start on this next one.